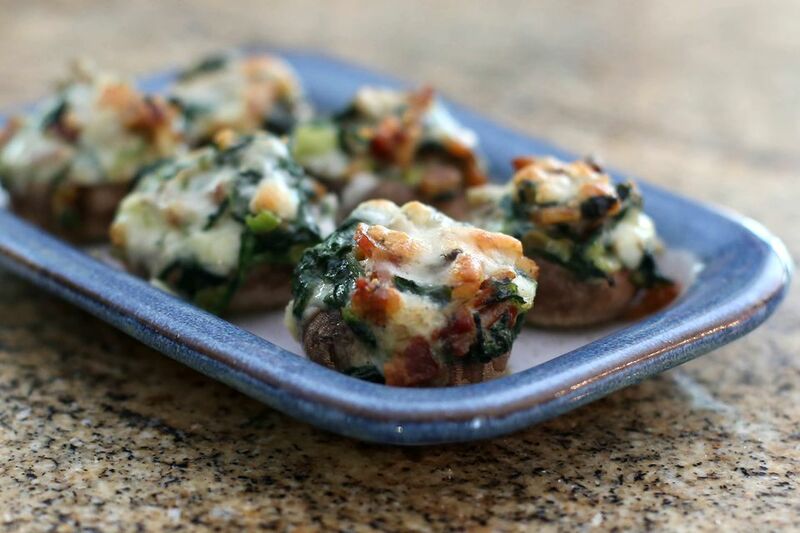 Melted fontina cheese throughout the simple fresh spinach and bacon filling makes these stuffed mushrooms as delicious as they are easy. And they are the perfect appetizer for gluten free diets. All of your guests will love them! Heat the oven to 400° F (200° C/Gas 6). Line a rimmed baking sheet with parchment paper. Wash the mushrooms. Remove the stems from the caps. Place the caps, rounded sides down, on the prepared baking sheet. Chop the stems and set aside. In a saute pan over medium heat, fry the diced bacon until just crisp; drain well. Leave about 1 tablespoon of bacon drippings in the skillet. Add 2 tablespoons of butter to the bacon drippings and place the pan over medium heat. Add the reserved chopped mushroom stems and the chopped onion or green onion. Cook, stirring, until the onion is translucent, about 3 minutes. Add the chopped spinach to the pan and cook until the spinach is ​wilted, about 2 to 3 minutes. Drain excess juices from the pan and transfer the spinach mixture to a bowl to cool slightly. Add the bacon and 1/2 cup of the cheese to the slightly cooled spinach mixture. Stir to blend the ingredients. Taste and add kosher salt and freshly ground black pepper, to taste. Mound about 2 to 3 teaspoons of the mixture in each mushroom cap. Top each with a little more of the fontina cheese. Bake for about 15 minutes, or until the cheese is melted and lightly browned and the mushroom caps are browned.